Playtech brings you another Marvel comic book-themed slot in Elektra. You must have seen the movie about a beautiful brave girl, perfectly wielding national Japanese weapons. Elektra is truly one of the most stunning and beautifully designed online slots in the gambling industry. 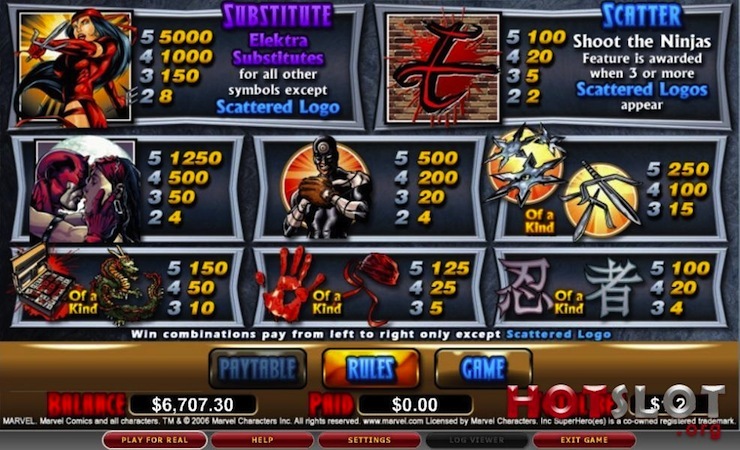 The slot offers fantastic graphics and effects, as well as unique and generous bonuses. Elektra serves as the wild symbol and the Elektra logo is the scatter symbol. The wild symbol can stand in for all others excluding the scatter. The combination of three scatters triggers the bonus game of up to 14 free spins depending on your choice of weapon. Moreover, all Marvel comics-based slots (including Elektra!) offer 4 progressive jackpots. Jackpot games are awarded at random and you are presented with a twenty icon screen. You select icons until three identical logos appear, you will then be awarded by a jackpot depending on the combination. Try your luck by playing a trial Elektra version with no registration needed.